Explainer It has been a bad month for Samsung. 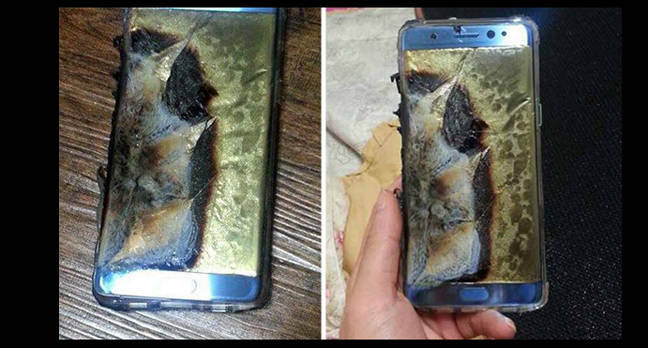 Following the release of the dual-curved, 5.7 inch-screen, water-resistant Galaxy Note 7 phablet, the number of fires have increased thanks to its reportedly explosive battery. A number of lawsuits relating to alleged mobile phone combustion have since been filed. The Korean tech giant reacted by halting sales, recalling units and launching an investigation. The exact cause of the problem hasn’t been pinpointed, but Samsung has said some explosions were due to a “battery cell issue”, and others may due to unrelated external issues. The disaster led to share prices plummeting on 12 September by 6.98 per cent. Samsung is starting to make a recovery, however, as share prices rise. What causes a series of batteries to become faulty? And what’s the difference between that and one-off explosions? It can be quite difficult to find out the exact reason as there are a lot of unknowns, Dr Paul Shearing, a senior lecturer in chemical engineering at University College London, told The Register. He was speaking about batteries in general and not any vendor's batteries in particular. “Faulty batteries could be due to a manufacturing problem. But that’s a broad category and can mean a wide range of different things. Normally it’ll be an issue that causes thermal runaway in the battery,” Shearing says. Thermal runaway happens when a heat-generating reaction within the cell raises the temperature, and it will keep increasing until the battery catches fire. In faulty batteries this could happen because of an internal short circuit, or if the input current or voltage levels aren’t correctly controlled, or - although this is rare - if metallic lithium is generated. Modern lithium-ion batteries have a low failure rate. Shearing estimates that in the last 25 years, batteries in consumer electronics have improved as they no longer use metallic lithium. Instead, the lithium is locked up inside a compound such as lithium cobalt oxide (LiCoO2). Like all alkali metals in pure form, lithium is very reactive. In a bid to shed its lone, outer electron, the light metal reacts readily – including when it's exposed to air. Neil Oliver, technical marketing manager at Accutronics, a UK manufacturer of batteries and chargers, said there were transportation challenges too. "On April 1, 2016, the International Air Transport Association’s (IATA) revised regulations came into effect. This meant that rechargeable lithium cells and batteries must be transported with a state of charge not exceeding 30 per cent and must be packaged in a way that mitigates the risk of packing highly energy dense batteries in such close proximity. Transportation of lithium batteries is also no longer allowed on passenger aircraft," Oliver said. Fast charge at your own peril! When charging lithium ion batteries, positive lithium ions from the cathode are channelled to the anode through an electrolyte. Lithium ions slip into a graphite structure in the carbon plate of the anode. If the charging process happens too quickly, the embedded lithium ions can accumulate and microscopic fibres called dendrites start sprouting from the anode and can pierce the separator, and begin extending to the cathode. An electrical current passing through these dendrites can short-circuit the battery. If the current is not controlled, the increased temperature can lead to metallic lithium deposits forming in the graphene structure which could make the explosions potentially more dangerous. Random explosions happen in a similar manner in faulty batteries with thermal runaway, but the reaction is environmentally induced, Shearing says. In extreme conditions, like car crashes, if a battery cell is punctured during the force of the crash and the cell becomes exposed to moisture in the air, it could lead to adverse chemical reactions. Shearing advises users to stick to the chargers provided with their mobile phones to avoid generating current or voltage levels that are incompatible with the battery.